Need to blow off some steam, ladies? Mommas, I know life gets hard and sometimes we feel like punching something (or someone)! Well, I have just the spot that allows you to workout and relieve stress. Meet David Flores– a personal trainer at Iron Fitness in Santa Monica. David has been boxing and coaching for the last 6 years and loves what he does! I met up with David for a one-on-one hour-long session at 5am sharp. He was ready to go with loud music bumping in the background...the kind of music you sometimes want to listen to, but can’t because the kids are around. He wasted no time and wrapped my hands to get started on with boxing. We began with some warm-ups and he taught me some basic punches. Our one-on-one session consisted of learning how to hit the punching bag correctly (by throwing punches at David), and cardio on an Assault bike. This was my first time boxing, and let me just say I came home feeling like I was the next Rocky Balboa! As a first timer, I felt the moves weren’t overwhelming, meaning, I was able to to keep up, plus I got a great workout. The next day my arms were a little sore, which only means I must have done something right. David says, “For anyone who has ever tried my workouts you’ll know how addictive it is,” and I agree! Whether it’s a high-intensity full body workout, a small group training session, a boxing class or you're looking to repair and recover with hands-on therapy and pain relief techniques, IRON Fitness offers it all. 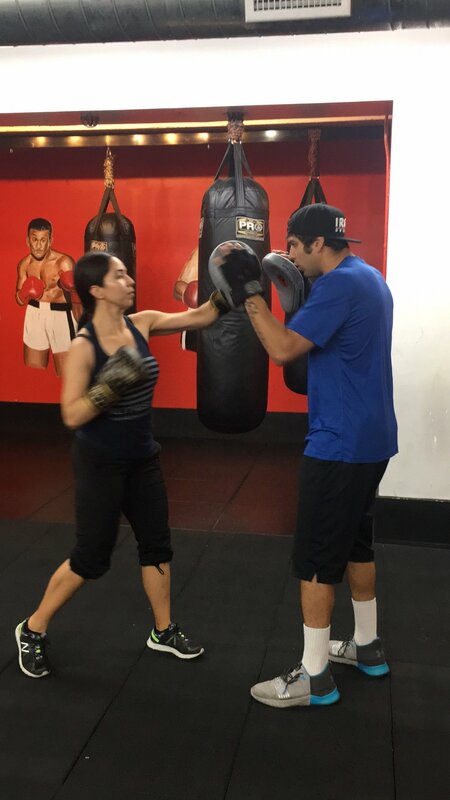 According to Iron Fitness' philosophy–– Boxing encourages the practice of strong mind/body connection by having the mind focus on timing movement in the body with the production of force. An elevated heart rate with intense max-effort bursts throughout class time encourages endorphin-production in the body — your “feel-good” hormones, providing a sense of calm and well-being.